The third release of the year for the ongoing series will be the Rutherford B. Hayes Presidential Dollar. He was the 19th President of the United States, with his term from 1877 to 1881. The obverse design for the coin has been released by the United States Mint in line-art format. The former President is pictured in profile, facing right. Inscriptions surround the portrait include “Rutherford B. Hayes”, “In God We Trust”, “19th President”, and “1877-1881″. On the reverse of the coin is an image of the Statue of Liberty with inscriptions “United States of America” and “$1″. Don Everhart designed both the obverse and reverse. Typically the portrait on the heads side of the coin is selected from amongst numerous design candidates prepared by US Mint sculptor-engravers and participants in the Artistic Infusion Program. For the present series, the reverse design remains the same from issue to issue. 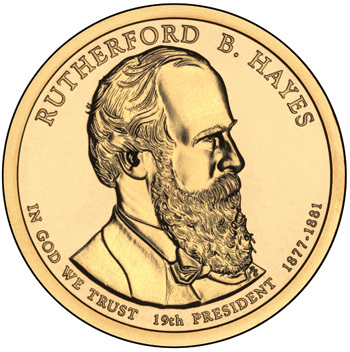 The circulation release date for the Rutherford B. Hayes Dollar will be August 18, 2011. The coins will make an earlier appearance in numismatic products offered by the United States Mint. This year, the 2011 Mint Set will contain a brilliant finish version of the coin, which should be similar in appearance to the regular circulation strikes.